As you can see from the reflection, this was taken with my very professional cell phone. Only the best here at Our house now a home! I thought the day before Thanksgiving would be a good to time officially kick off Christmas decorating. I was teasing about it earlier, but it is official kick off time! I am in planning mode, so anything around the house is fair game with inspiration. 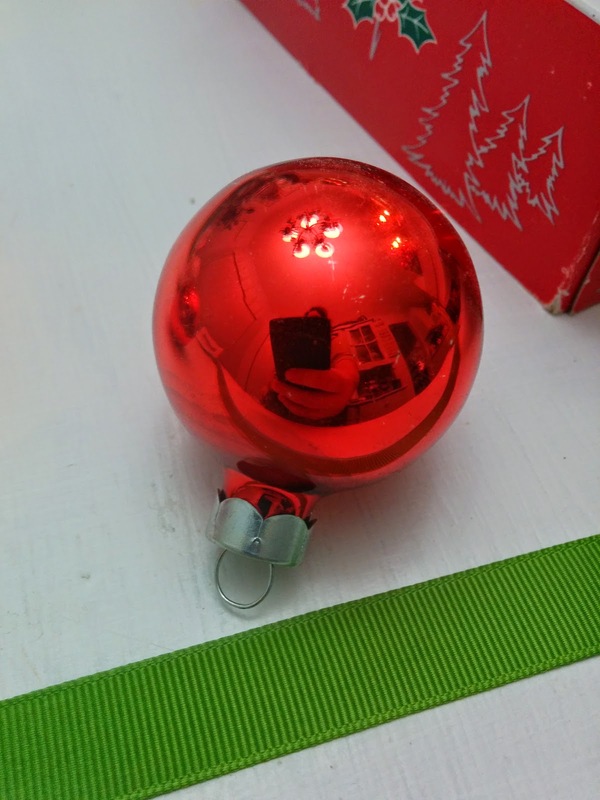 I have some round, shiny, ornaments. 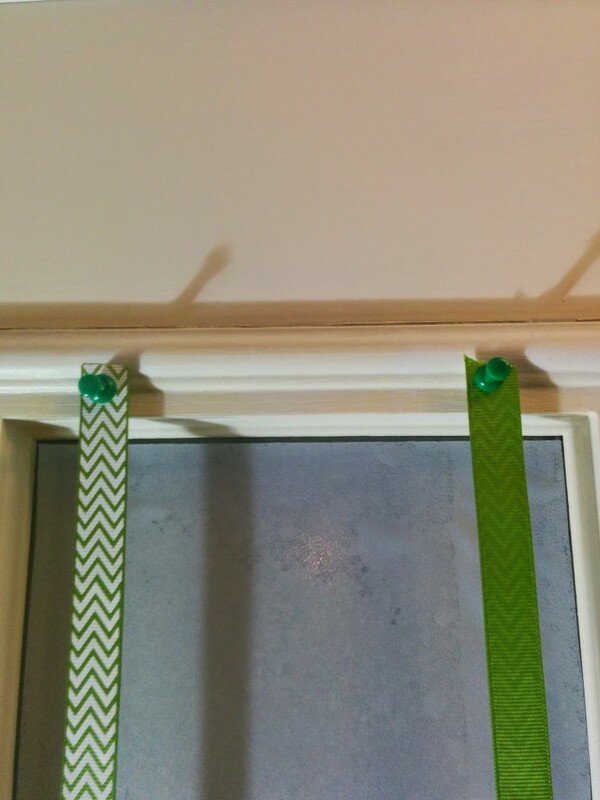 And some green ribbon. I decided to become crafty and put it together. 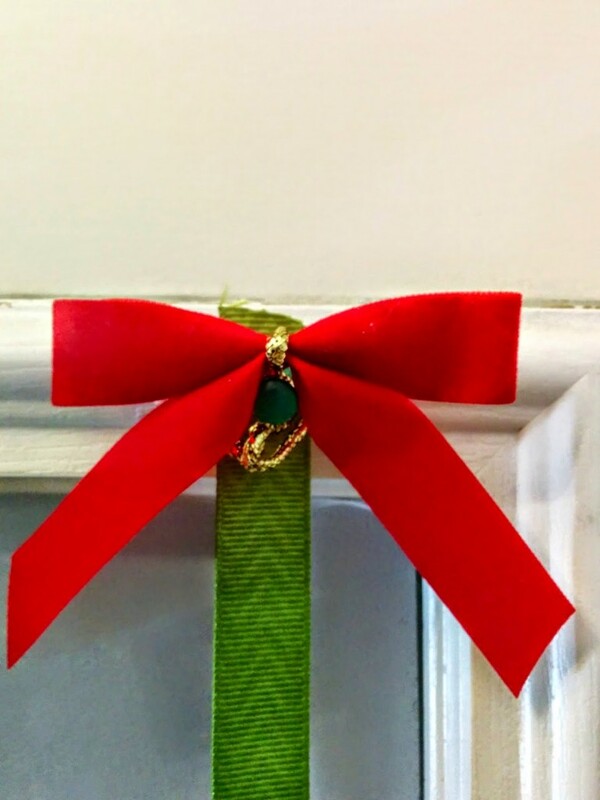 Step 1, I tied the ribbon around the loop of the ornament. 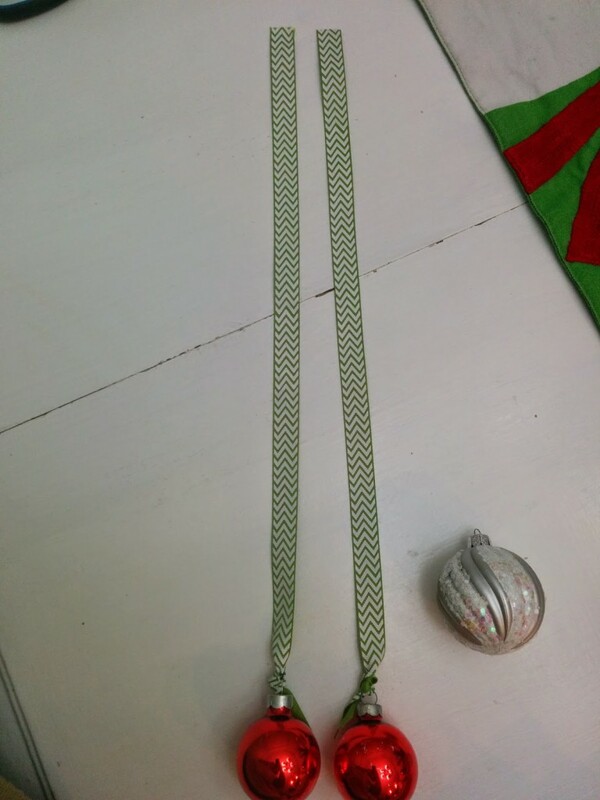 Step 2…… The hanging Christmas ornaments are ready to be hung. I know, I am getting really complicated here. Seriously, sometimes I cannot think of a project at all. Creative project block, sort of like writers block but for the DIYer. Other times something simple, easy, and cheap just pops up all ready to go. The day before we all stuff our face with food seems like a good time to take it easy. 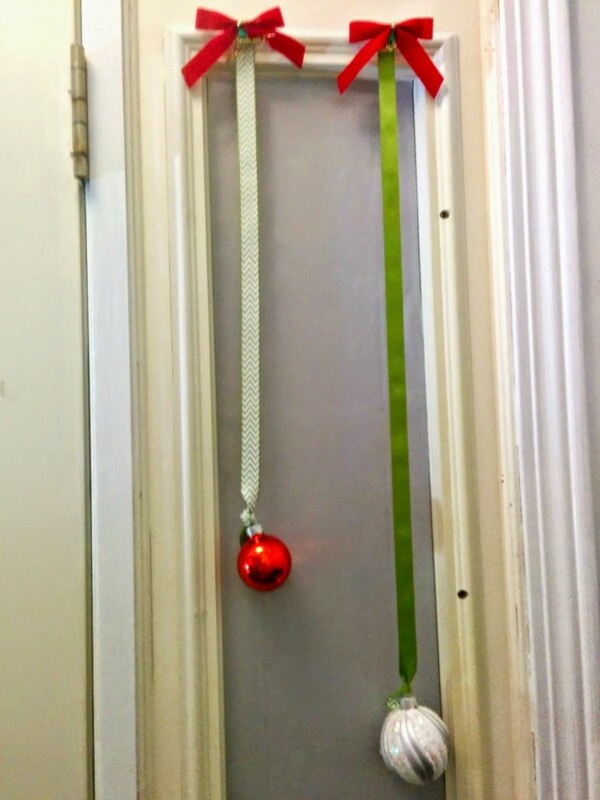 This is the baby steps version of Christmas decorating. 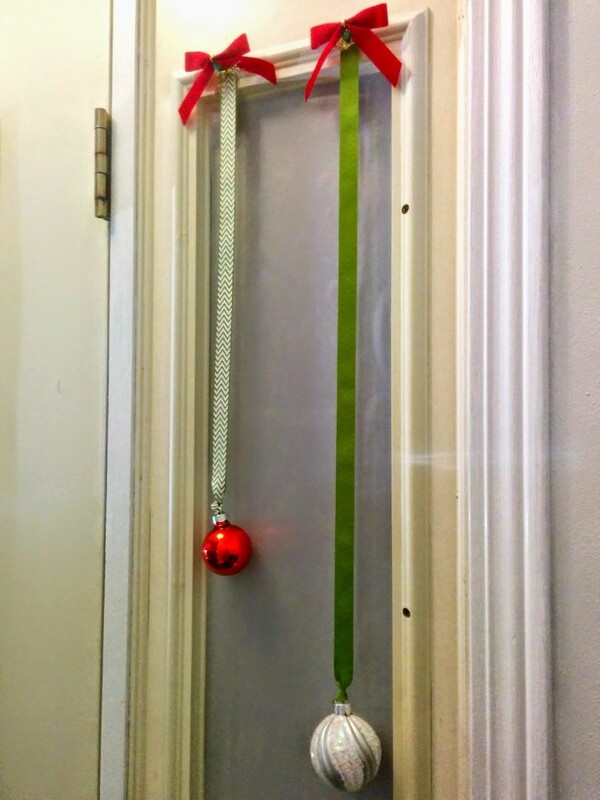 In keeping with the simple theme I hung these on either side of my front door. With the most pro tool ever. Tacks, oh yeah. We keep it fancy around here. Now come on, I am not going to leave the tacks as they are. I am much more creative than that. I added some trusty pre tied bows. And then, voila! The hanging Christmas ornaments are done. It took me all of 5 minutes from thought to completion. This is the best kind of crafty project. This one was a no hassle, one done during dinner being made, and the kids running around. It did not even make our day pause. There is time for flashy and showy with holiday decorations. And I have plenty of that coming……! Did I mention I am excited for what is to come, I am eager to share some great projects, huge impacts, and all low cost. It is the budget decorating with a classy feel. I managed to get a Champagne look on a beer budget. Some projects, on a NO budget. I like stretching myself, and regardless of my actual budget I challenge myself to spend as less as possible. I think I have achieved that this time around. 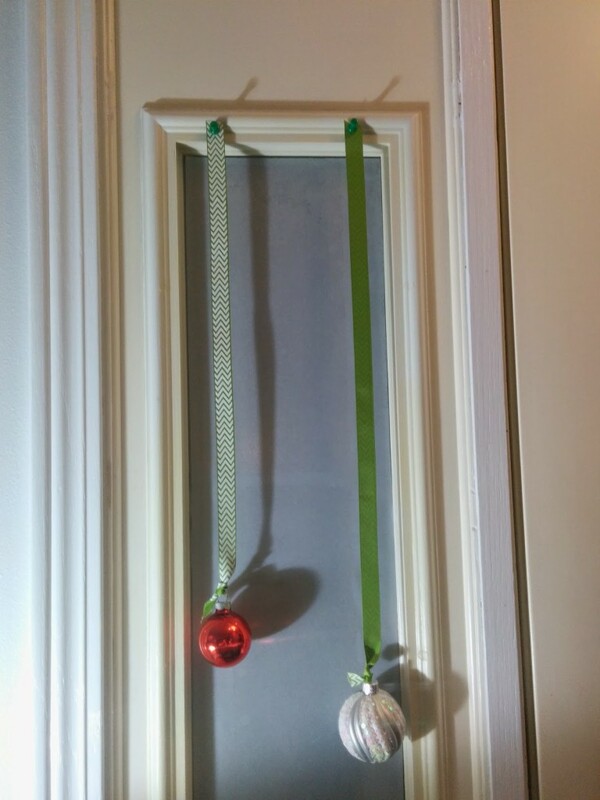 These hanging ornaments are the first of many cost saving and anyone can decorate their home ideas I will be sharing all month long. I hope you all have a wonderful Thanksgiving, enjoy your day, your food, and your loved ones. And for all of you brave souls going out for the black Friday shopping, good luck. Sometimes clearance and sales are not needed to save money. All you need is an idea, a little inspiration, some ornaments and ribbon. At least in this case, for today that is all that was needed.